"In the world of art, a picture can paint a thousand words. In the world of computing a good example does much the same thing. 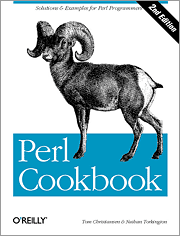 The Perl Cookbook is a superb collection of coding snippets which cover all manner of subject areas in a fashion that proves suitable for beginners and established programmers alike. From date formatting and text searching to socket programming and creating Internet services, it's all here and each is a little gem. Authors Tom Christiansen and Nathan Torkington have done a sterling job of documenting each code snippet through explanatory text and in-line comments which goes a long way to helping the casual user understand what is going on and more importantly, how and why." "Larry Wall wrote Perl and he wrote Programming Perl. Better yet, he writes amusingly and well--all of which comes across in this latest edition of the definitive guide to the language. 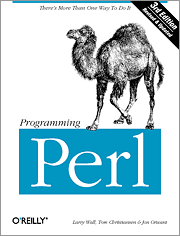 Like Topsy, Perl just grew, and as a result the need for a third edition came about. It's now over 1,000 pages, which it needs to be, as it performs several different duties. First, it's an introduction to the Perl language for those who are new to programming; also, it's a guide for those who are coming from other languages; and, finally, it's a Perl language reference. Even if you have both previous editions, you'll want this latest version--if only for the new jokes." "Perl has always been a powerful and popular programming language but with its new object capabilities, it can do even more. 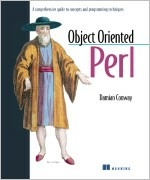 Written for anyone with a little Perl experience, Damian Conway's Object Oriented Perl provides a truly invaluable guide to virtually every aspect of object-oriented programming in Perl. "The most notable thing about Object Oriented Perl is the author's excellent perspective on object- oriented concepts and how they are implemented in Perl. This book does a remarkable job at cutting through traditional jargon and illustrating how basic object- oriented design techniques are handled in Perl. (A useful appendix attests to the author's wide-ranging knowledge, with a comparison of Smalltalk, Eiffel, C++, Java with Perl, including a summary of object-oriented syntax for each). This book also features a truly excellent review of basic Perl syntax. "Throughout this text, the author shows you the basics of solid object design (illustrated using classes that model music CDs). Basic concepts like inheritance and polymorphism get thorough and clear coverage. 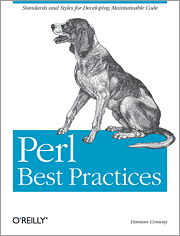 The author points out common mistakes and provides many tips for navigating the powerful and flexible (yet sometimes tricky) nuances of using Perl objects. For instance, he shows how to achieve true data encapsulation in Perl (which generally allows calls across modules) as well as its natural support for generic programming techniques. "The author also pays good attention to popular object modules available from CPAN (like Class::MethodmakerK, which simplifies declaring classes). He also discusses performance issues and the trade-off between programming convenience and speed often faced by today's Perl developer. Advanced chapters cover a number of techniques for adding persistence and invoking methods using multiple dispatching. "Filled with syntactic tips and tricks, Object Oriented Perl is a sure bet for any programmer who wants to learn how to use Perl objects effectively." "If you are looking for a book to teach you how to program Perl, this is definitely not what you need. Also, if you are cranking out quick Perl scripts to solve one-time tasks, it might not be worth the effort to read this book. However, if you are fairly comfortable with the language and are looking for ways to improve your code, this book would be a wonderful addition to your bookshelf." 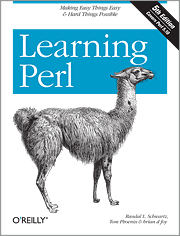 "Learning Perl is a programming library's foundation title and a highly recommended pick: it covers all the basics of what most programmers use and need to get started with Perl, and offers up a fifth edition of a classic first published in 1993."